Apple Sunset is a very popular apple variety. Often chosen as an alternative to the tricky 'Cox's Orange Pippin', the flavour is very similar, but Sunset is a much easier apple tree to grow. The apples have orange and red flushed skin and you can expect heavy crops of them in September. 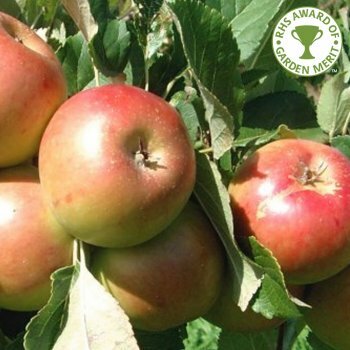 A delicious eating variety, Apple Sunset is from Kent in 1918 and requires a pollinator in group A, B or C.
Sunset is a pollination group B apple tree and requires a suitable pollination partner within a half mile radius. Apple trees should be spaced according to their rootstock, for example an MM106 (semi-vigorous) rootstock will require approx. 4.5 metres between trees, whereas an M27 (very dwarf) rootstock will require approx. 1.5 metres between trees. Our pot grown Sunset apple trees can be planted at any time of the year but bare root ones need to be planted between November and March. Remove weeds and grass within a metre of your desired planting hole then dig a hole slightly deeper than your root mass and approximately 3x as wide. To help your tree establish more effectively, apply root grow. Gently loosen the roots and place into the planting hole. Using 50% of the original soil and 50% compost, fill in the hole and firm around gently. Make sure not to bank the soil up around the collar of the tree. We recommend planting fruit trees using a stake and tie and a rabbit guard.